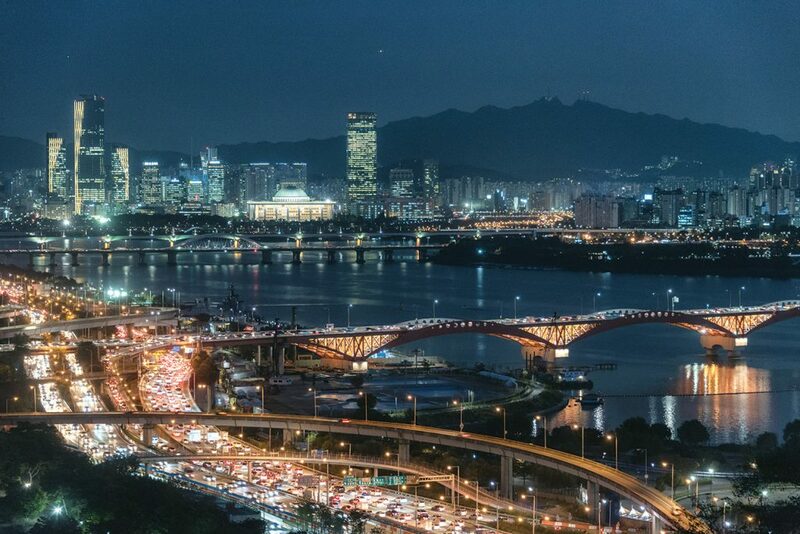 The Hangang River is Seoul’s defining geographic feature. Slithering slowly for 40 kilometers through the heart of the city, the waterway is a scenic attraction, a social dividing line and an artery of transportation and trade. So important the river is to the life of Seoul that without it, this city of 10 million people would not exist. 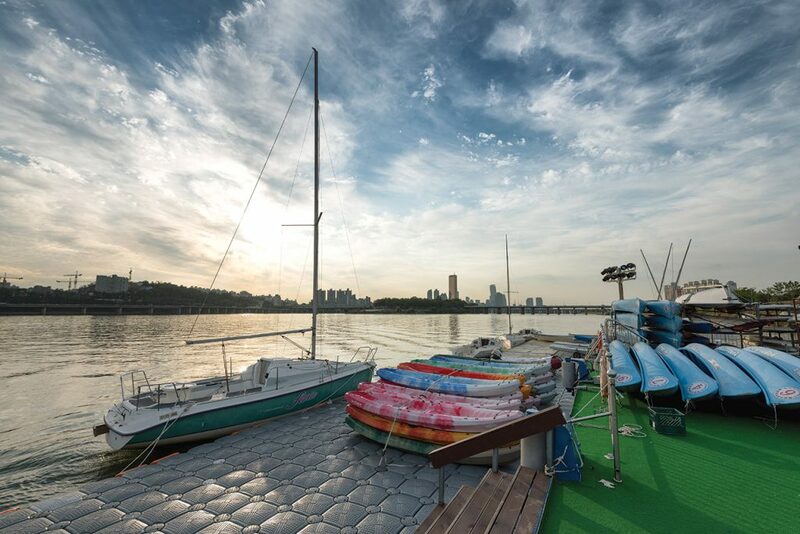 In this issue of SEOUL, we visit a handful of spots from which we can appreciate the river and the city to which it gave birth in their terrible immensity. Rising less than 100 meters, Mt. Eungbongsan hardly deserves to be called a mountain. What the bluff lacks in height, however, it more than makes up for in views. 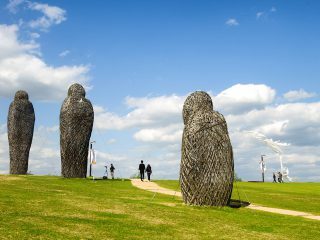 With panoramic or near panoramic views in two directions – eastward towards Ttukseom and Jamsil, and westward towards Yongsan and Banpo – the hill is one of the best vantage points on the Hangang River. It’s also relatively easy to get to, being just a short walk from the Jungang Line’s Eungbong Station. The views and the convenience make it a very popular destination for Seoul’s photographers, both professional and amateur. Mt. Eungbongsan’s biggest draw, photographically speaking, is the bundle of highways, roads and bridges that stitch together Seongdong-gu, Ttukseom and Apgujeong. The giant loop of the entry ramp of the Yongbigyo Bridge is especially picturesque, resembling as it does a giant concrete bow. The bridges and roads lend themselves to nighttime photography of traffic trails. To do traffic trail photography, use a camera capable of shooting long exposures; naturally, bring a tripod as well. A 10-second exposure should do the trick. Though Mt. Eungbongsan is most popular at night, it’s a decent spot to take in the sunrise, too, especially in winter, when the sun rises further south. If you’re more of a day person, the best time to visit is spring, when the hill is covered in bright yellow forsythia blossoms. The blossoms also make it a popular picnic spot. GO> Eungbong Station (Jungang Line), Exit 1. Walk straight, swing a left at Gwanghui Middle School, and keep walking until you get to the entrance of the park. Nanjido, where World Cup Park is today, was once an island in the Hangang River, and an apparently beautiful one – its name translates as “isle of orchids and irises.” Though as prone to flooding as the Hangang River’s other sandy islands, Nanjido was a popular place for school picnics. Local farmers raised peanuts and sorghum there, too. Some 15 years and 92 million tons of garbage later, what was once an island had become two giant mountains of reeking waste. After the landfill was closed in 1993, city officials began stabilizing the mountains of waste in order to transform them into an ecological park. The parkification project took on added significance in 1997 when the spot was named the home of Seoul’s new World Cup Stadium. Workers completed the land stabilization in 2001; they completed the park the following year, right before the start of the Korea-Japan FIFA World Cup. World Cup Park is divided into several smaller parks: Haneul Park, Noeul Park, Nanjucheon Park and Nanji Hangang Park. The first two, Haneul Park and Noeul Park, were built atop the old mountains of trash. 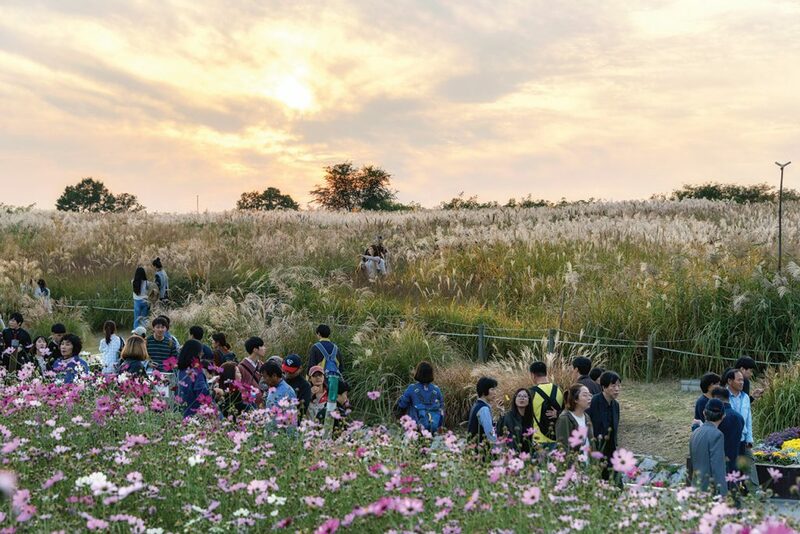 These two great hills of green, rising nearly 100 meters from the bank of the Hangang River, are covered in immense fields of grass and reeds, fields that are crisscrossed by walking trails and punctuated by observation decks. 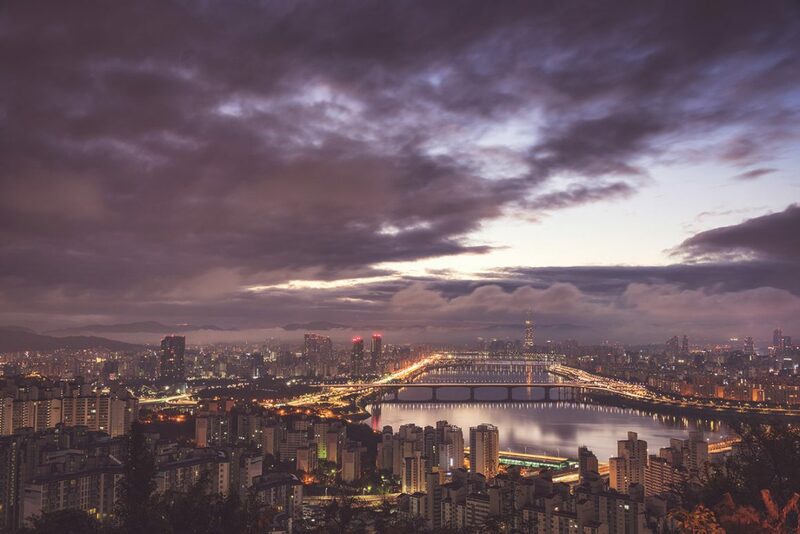 Noeul Park – or Sunset Park, as the name translates – offers fine views of the sun as it sets over the Hangang River. 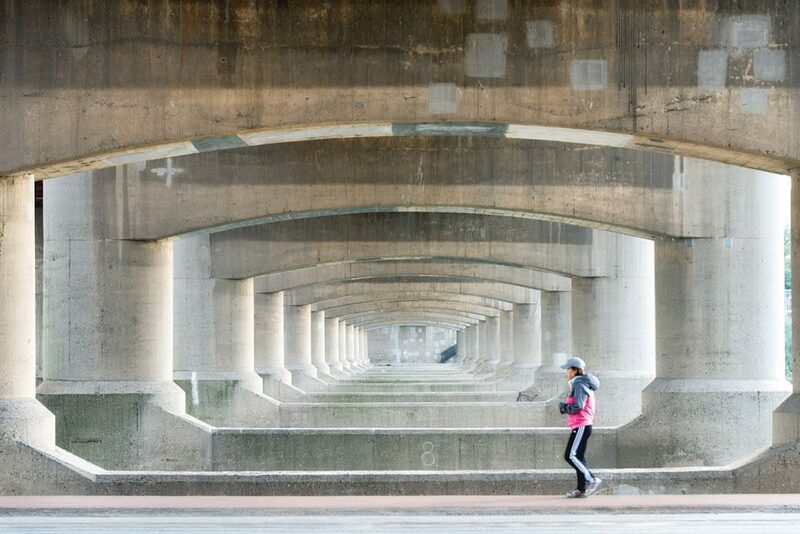 In this writer’s opinion, however, better views of the river await at neighboring Haneul Park. The sunset views are nearly as good as they are at Noeul Park, and the eastward views toward Yeouido are even better. 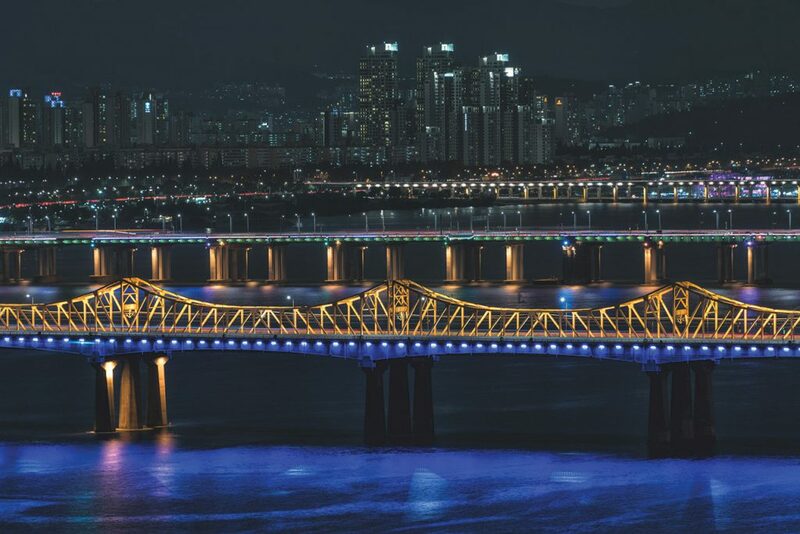 The vistas grows even more beautiful at night, when floodlights illuminate the iconic dome of the National Assembly building on Yeouido and the orange arches of the Seongsan Bridge. Mt. Maebongsan is a little-visited hill behind Yongsan’s sprawling Namsan Town apartment complex. To most locals, it’s little more than a neighborhood park, a place where elderly residents can get in their morning’s exercise at the obligatory hilltop exercise set. If you go in the early morning, you’ll find only a handful of hardy, health-conscious grandfathers and grandmothers stretching, lifting weights or doing calisthenics, sometimes to martial music. The photographers are there for the views. Though nobody would call the mountain a major leisure destination, it does offers some of the best views in the city of the Hangang River. Straddling the districts of Yongsan-gu and Seongdong-gu, the peak overlooks an especially picturesque bend in the Hangang River as it meanders through eastern Seoul. 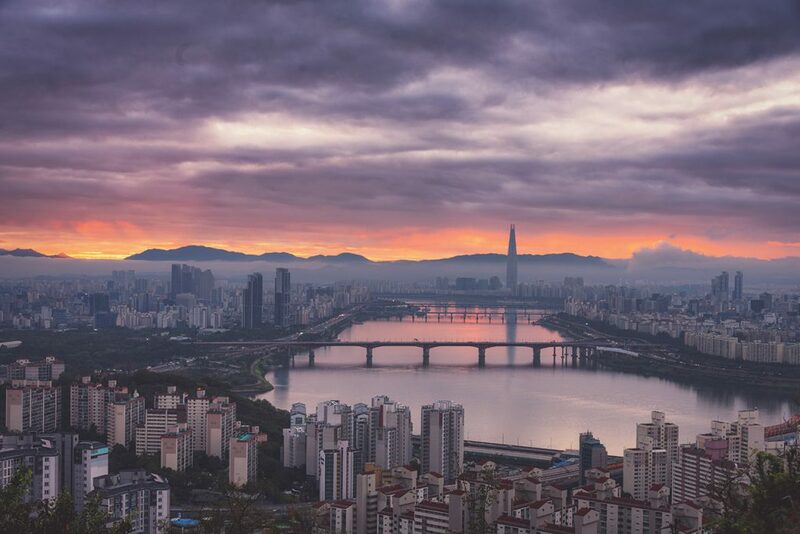 From the Korean-style observation pavilion at the top, you can enjoy a bird-eye view of the river, its bridges, the Ttukseom and Jamsil areas, the Lotte World Tower and the mountains that lie to the east of the city. Nowhere else offers such a direct, unimpeded view of the river from an elevated location. Mt. 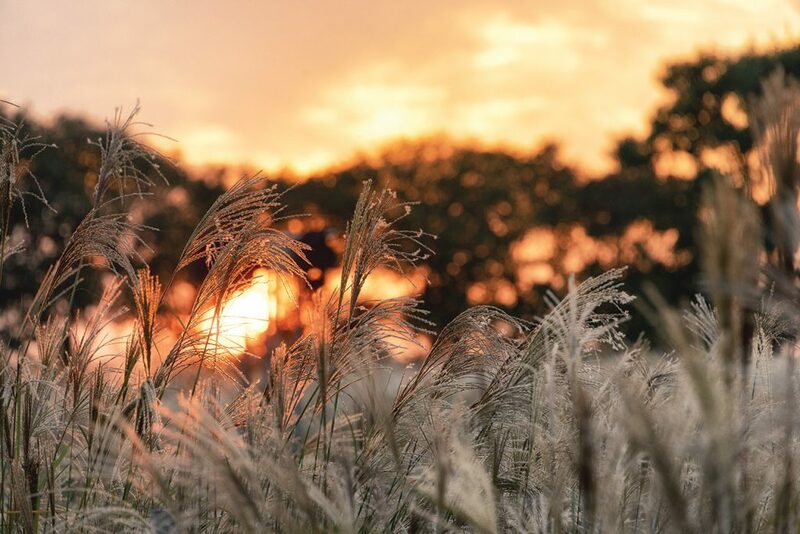 Maebongsan’s sunrises are particularly inspiring. When the weather cooperates, the river reflects the kaleidoscope in the sky above, the water glowing blue, purple and orange as the sunrise nears. Depending on the time of year, the sun may or may not rise directly over the river itself, an impressive scene indeed, although some photographers prefer times when the sun rises from directly behind the Lotte Tower, a phenomenon likened ad nauseam on social media to the Dark Tower of Mordor in J. R. R. Tolkien’s novel “The Lord of the Rings” and its film adaptations. The peak is a great place to take in the first sunrise of the year, too. Though this writer highly recommends waking up early to take in the sunrise – and waking up extra early so you can get a good spot to set your tripod – Mt. Maebongsan offers more than just sunrises, though. The peak provides some of Seoul’s best nighttime cityscapes, and the 10-minute walk to the top is much less grueling than the hike up some of the city’s other nighttime vantage points such as Mt. Inwangsan and Mt. Inwangsan. A particularly good time to visit is on nights of the so-called “supermoon,” when the moon looms large in the sky. The spot offers lovely moonrises over the river, at least when the weather cooperates. To capture the moonrise, bring a powerful zoom lense. GO> From Oksu Station (Line 3), Exit 5 or 6, walk towards the entry to the trail, which is behind the Oksu Geukdong Apartments. This writer, however, usually takes a taxi up the road in front of Seoul Bangsong High School, where there’s another park entrance. As part of the project, public parks were created along the entire 41.5km length of the river, from Hail-dong in the east to Gaehwa-dong in the west. Hangang Park, as the system is called, is divided into 12 districts: Gwangnaru, Jamsil, Ttukseom, Jamwon, Banpo, Ichon, Yeouido, Yanghwa, Mangwon, Seonyudo, Nanji, and Gangseo. 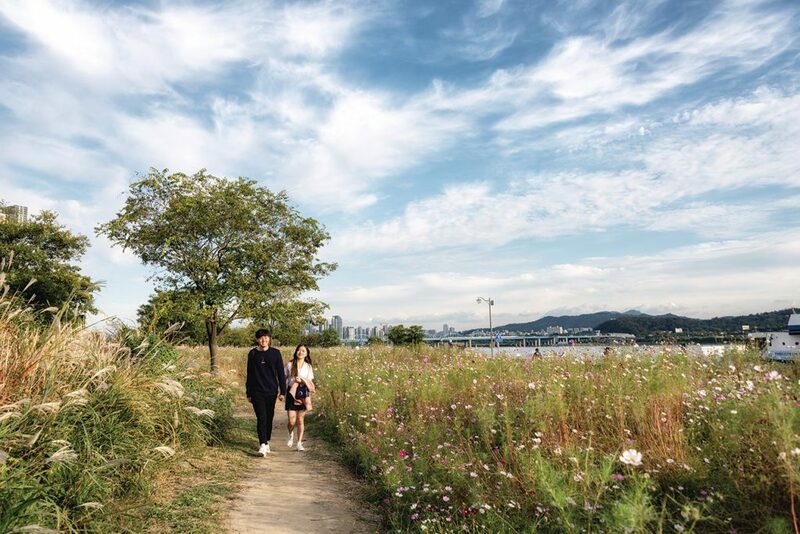 These parks are among the city’s most popular leisure spots, their bike paths, walking trails, sports fields and green spaces offering daily respite to thousands if not million of Seoulites. Stretching just over 10 kilometers along the north bank of the river, from the Jungnangcheon Stream in the east to the Wonhyo Bridge in the west, Hangang Park’s Ichon district is this writer’s favorite section, in part because of its great views of Yeouido, the former sandbar having long ago metamorphosed into Seoul’s Manhattan, complete with glass and steel skyscrapers. Ichon Hangang Park’s real charm, however, is its greenery. Its fields of barley in spring. Its gardens of cosmos flowers in autumn. Meadows of silver grass shimmering in the warm sun of the afternoon. Ichon Hangang Park is a lovely sunset spot, too, the silhouettes of Yeouido’s towers providing an appropriately dramatic backdrop. 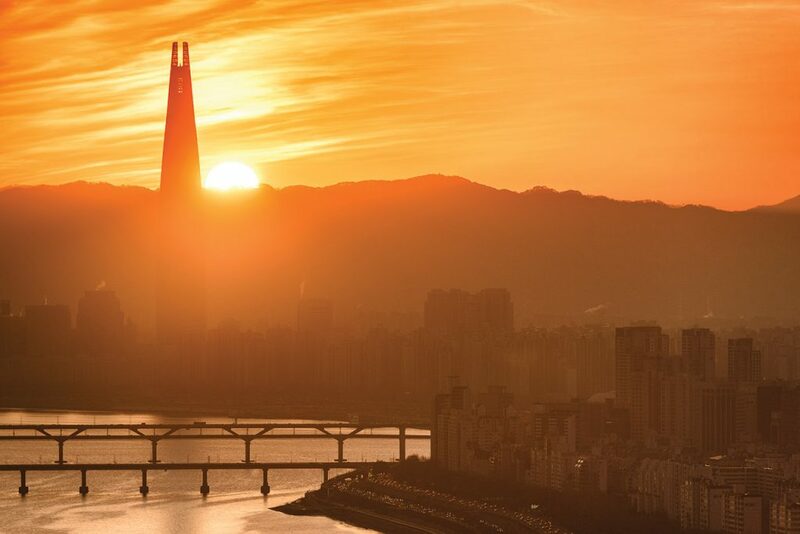 The café atop the Hangang Bridge offers the best views of the sun as it sets over the river. The park is also the best place in the city to take in the Seoul International Fireworks Festival, held every October, although the spectacular views of the fireworks over Yeouido are mitigated somewhat by crowds so dense you may have to walk through or over half the population of the city to get from the river to the park exit.